Ok, so 6 new tamiyas so far this year obviously wasnt enough, so i ended up buying this! It doesnt appear to have been driven too much before being crashed. 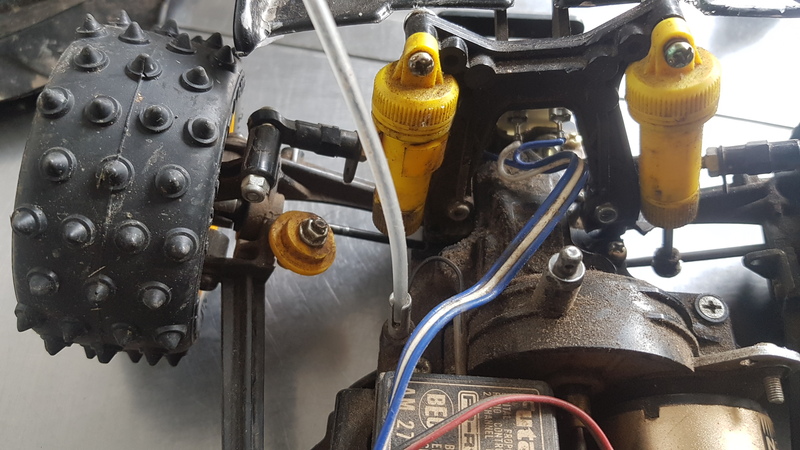 It has a broken C1, broken G4, broken G11, one broken shock shaft, missing right rear drive cup, missing rear roll bar, missing rear springs. Its also filthy. But, plus points, has radio gear, chrome techniplus, technigold motor and it appears to be ballraced. It also has avante wheels with good tyres. I love avante wheels but not so keen on avantes so all good. I think the body paint will strip ok, needs new decals. Needs the broken plastic parts replacing. Has a bit of play in one front arm and loads of steering play. It came with another shock, and i have some vintage cva spares including springs so im hoping this will go back together quite easy. Just need C1, G4, G11 and the drive cup and sway bar. I do however also have a set of hi caps that were going on my super astute but may go on this instead, or maybe ill swap them for avante shocks. I also have an egress rear sway bar i think i may be able to fit. I also have a complete pair of egress re re ball diffs that could be used, along with new egress arms. 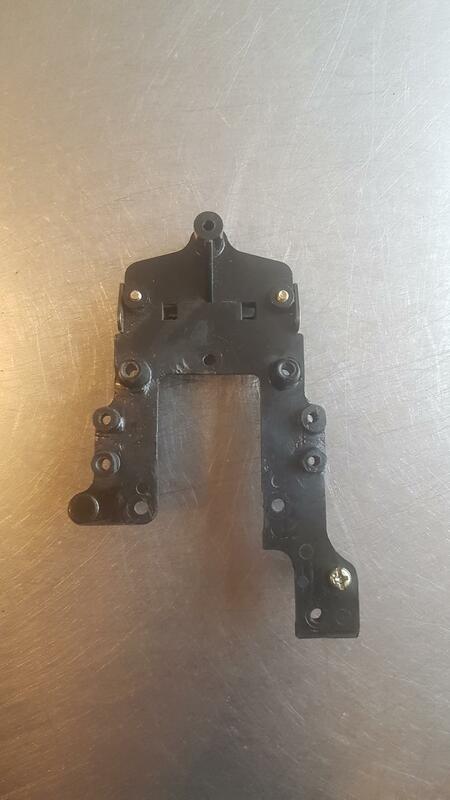 I also have egress chassis plates and all the hardware. However, i think i may keep this as vanquish as possible. So, initial questions, the drive cup... i believe they may be vanquish/avante only? Or are they the same as any others? Seems i need at least one cam lock for the wheels and as long as the cockpit cleans up, a driver figure too. Avante one maybe. 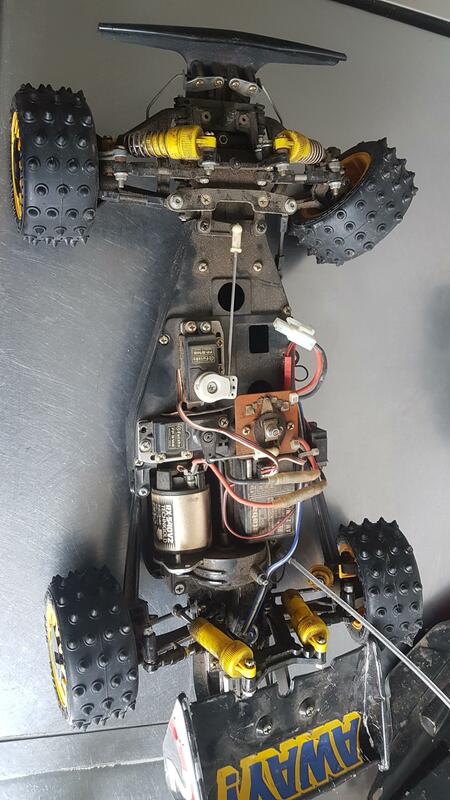 My first 4WD Buggy and designwise still my favourite. But if you already have them, you could swap them in as they include new outdrives, that should also fit the Vanquish drive shafts. I bought a complete Vajra to take the expensive spares for my Vanquish (wanted to build a sleeper with some improvements. Sway bar of Vanquish was a little thinner, Egress one is too thick and long, due to the different mounting method. To Keep it cheap, you could bend your own from steel wire!? 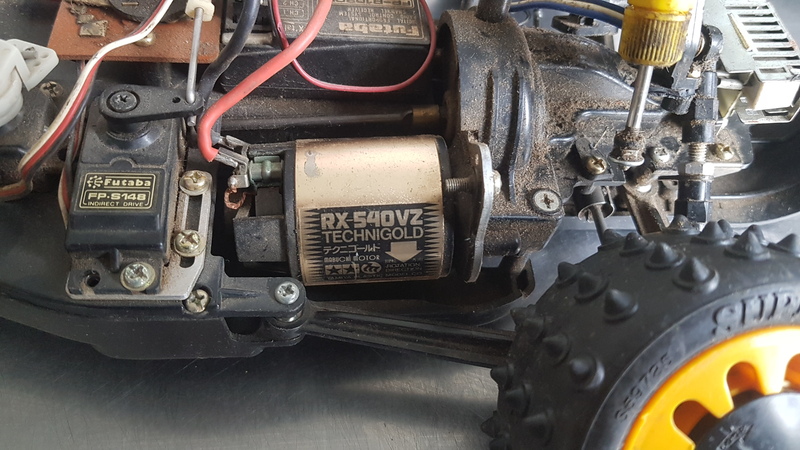 The Technigold is great, I remember we also burnt down the mechanical Speed controls with the higher Amps of such motors! The original steering Levers are quite precious. Couldn´t find one for my Vanquish shelfer, so I mounted 2 Egress RERE Levers with leftover brass bearings. I already have the egress steering parts so they will go on. I have all the mounting hardware for the egress rear sway too, but if i can find a vanquish one ill use that. 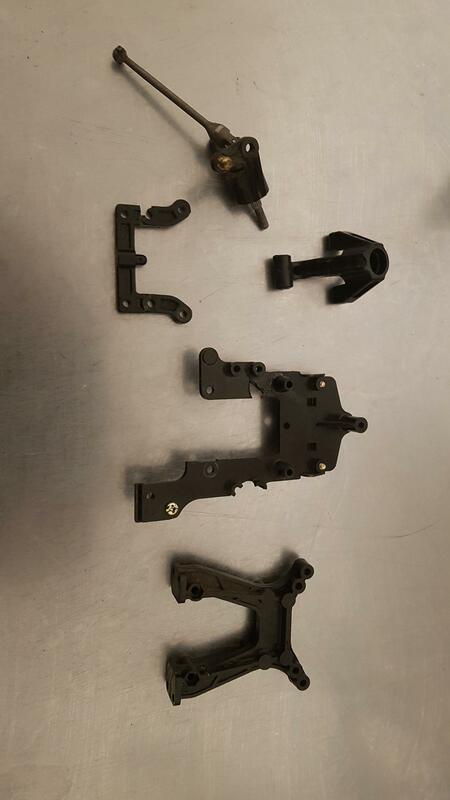 I have loads of re re egress parts but i was going to sell some of it. I also dont want to end up just rebuilding it into an egress. I have the gold front uprights too etc. Ill see how i feel as things unfold and as i find out how tricky vanquish bits are to find. 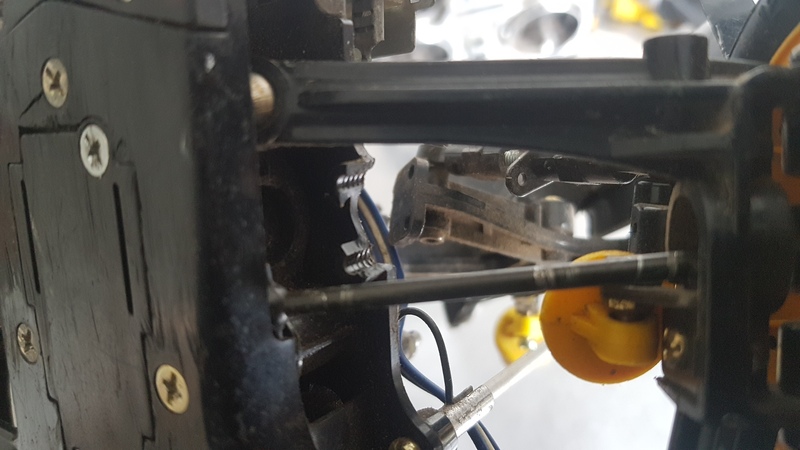 Don´t forget: If you want to run the Egress stabilizer, you have to move the shocks behind the wishbones, as the Fixing is needed for the stabilizer then. Moving the shocks is something i want to avoid and is the main reason i probably wont use the carbon chassis parts. I probably will use the gold uprights, but depends if it even gets run. I have had a bit more of a poke. It seems one rear driveshaft is longer than the other. I think the longer one is wrong. However, i had a random drive cup that fits and works perfectly with the longer dog bone. This cup is a little short i think. It wouldn't work with the right dog bone. Question is, do i take that as fixed, its all spot on with the same amount of clearance as stock. Or, admit to myself that its not 'right' and find the correct parts even though it makes no odds. I also have some rear springs and shock mount ball joint (silver not gold though), dont seem to have the right shock shaft though. These rear shocks have really short shafts. The piston discs have loads of holes too, and quite thick oil. Ive a suspicion this may not be correct, ill have to have a good look at the manual. Dammit, i guess i should have expected it, but front shock tower is broken too. Pretty sure c3 shouldnt be this shape! Other side is ok.
Its not surprising really, i always thought this car must have took a pretty hard hit to do all the damage i knew about. 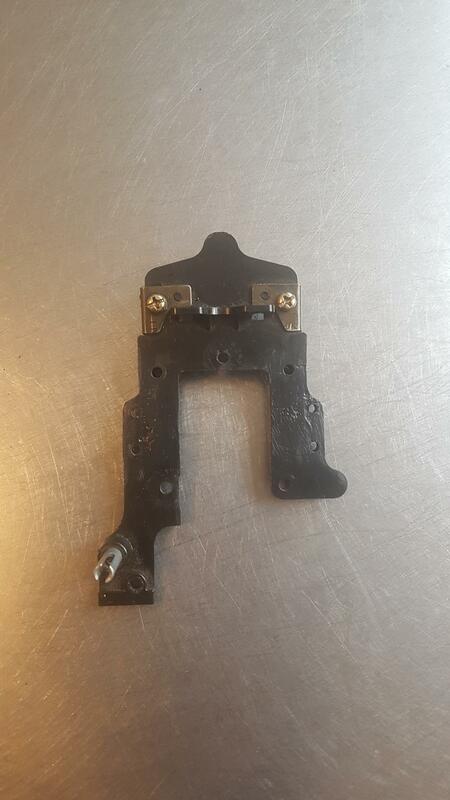 I was bored so i had a look at the broken parts. Wouldnt normaly bother, but vanquish parts are hard to find. 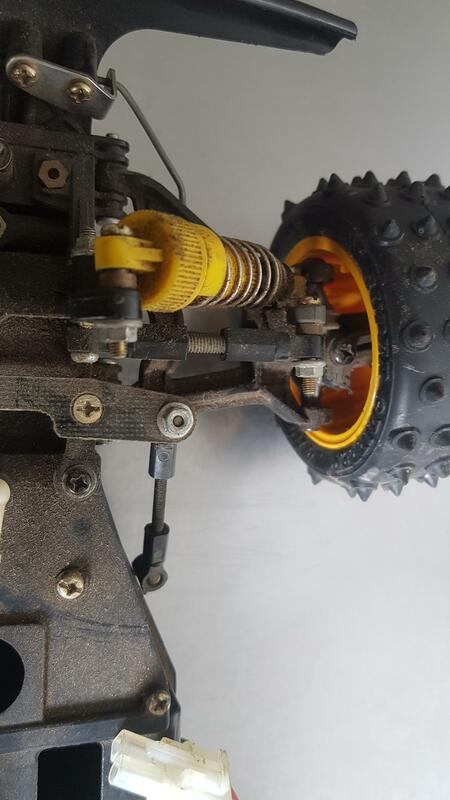 Rear shock tower was bent and the base had broken in two. Front shock tower was in 3 pieces. I boiled the bent bits and tweeked them back into shape and solvent welded the broken pieces back together. As long as i picked the right solvent (it seemed to work properly with whatever these are made from) then they should be plenty strong enough. The missing parts of the shock tower will be built back up with some donor plastic. 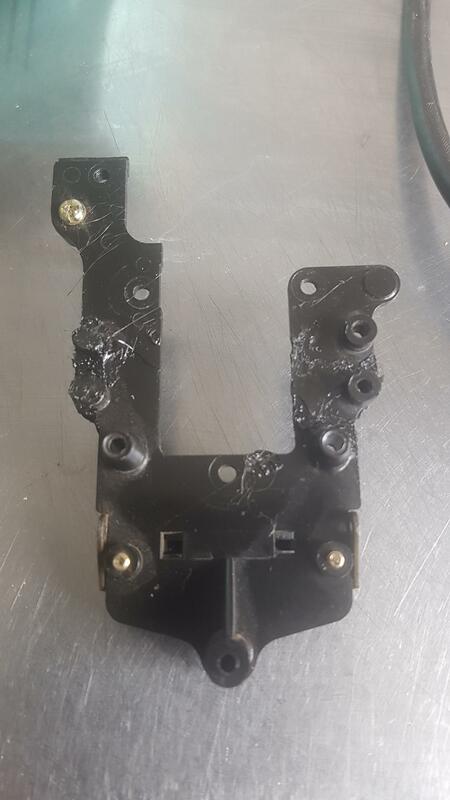 I could do the same with g11 too, but its such a weak design for such a high stress part i may just make a replacement from either aluminium or carbon fibre and turn some alloy pieces for the various mounting bosses. The parts should be fine untill i cam track down replacements. Will be interesting to see how well they stand up to use. The solvent is methylene chloride applied with a syringe. It disloves the plastic so the pieces melt back together rather than adding any kind of bonding agent. I stopped off and bought some de solv it today so stripped the body. Came off ok. Body isnt too bad, one small split and needs the usual trimming tidy. Wing is pretty battered though and decals are damaged. Im undecided what to do. I could buy repro stuff, or just repaint and keep it in runner condition untill a re re happens. Think ill paint this set, sho goo the wing and see how it looks. Will do for a runner body if nothing else. Problem with the repro stuff is shipping and duty to the uk. This car is proving a bit of a challenge to get parts for, as all vanquish owners no doubt know. Im resorting to drastic measures!!!! Mainly, plastic welding and rebuilding missing sections. G11. It was in 3 bits. I solvent welded them back together but it didnt take well. There was also 2 chunks missing, including half of the shock tower mounting bosses. So, i plastic welded it back together and melted new plastic to fill the missing sections. I found a bit of sprue that was the same type of plastic for the filler. Its not the right shape. It is however as strong and flexible as before it was broken and has plastic everywhere is should have. But a fair amount of work with a knife, file and sandpaper will get it looking presentable. Its a long tedious process that will leave me with a usable part that will always look a little rough, but it will do untill some G parts turn up, or tamiya decide to re re it. Ill post more, better, pics when ive shaped it. This is only the very first stage! G11 is done. Not very pretty, but strong and functioning. As i say, will do until i can source a replacement. That’s impessive work - you can be proud of that! I guess if i was willing to put a few more hours into it i could get it looking alot more factory, but i only wanted to get it usable and not too untidy. If it was truly irreplaceable it would be worth spending another half a day on it. Im now finding out my batteries dont fit! The battery tray is daft narrow and the cable outlet options are limited. Doesnt even look like there is an easy chassis mod that can be done. 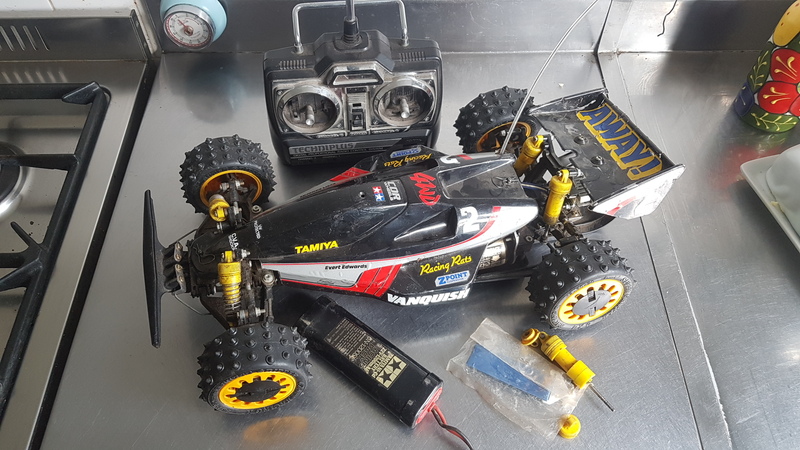 I can either run it on the 1200sc nicd, buy more batteries even though ive only just bought lipos that fit every other vintage tamiya!, or give in and convert to egress rere chassis. Would really like to keep this all stock though. 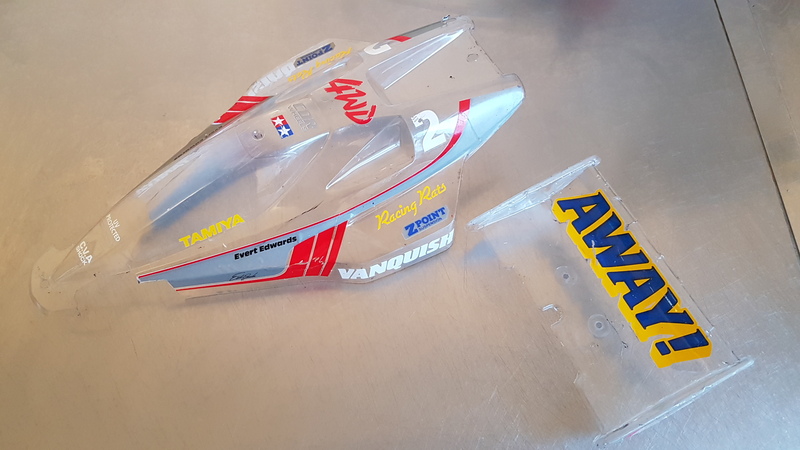 Edit, maybe lack of modern battery fitment is why tamiya havent rere'd the vanquish! Even my old 3800 nimh dont fit! No real way to redesign it either. Finally got the vanquish stripped. 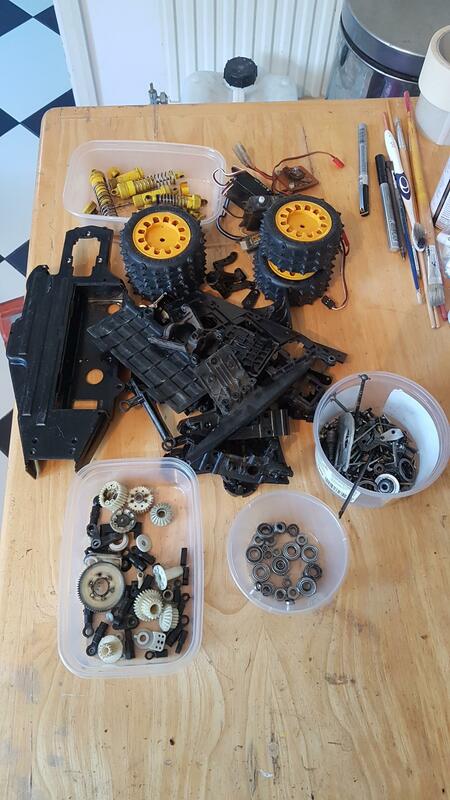 All parts have been checked and are ready to clean. G11, so i dont need to use my repaired one. It was fully ballraced apart from the odd sizes in the gearbox but i got those from a couple of scrap avante gearboxes. It could probably do with a wing, ill see how the original one goes. Im keeping it on the avante wheels because i love them. Apart from that, i am thinking i should keep it bone stock. I could fit ball diffs (i have them), i also have some rere gold front uprights i could fit and ball bearing steering. I have suitable turnbuckles too. But, it is in good condition. 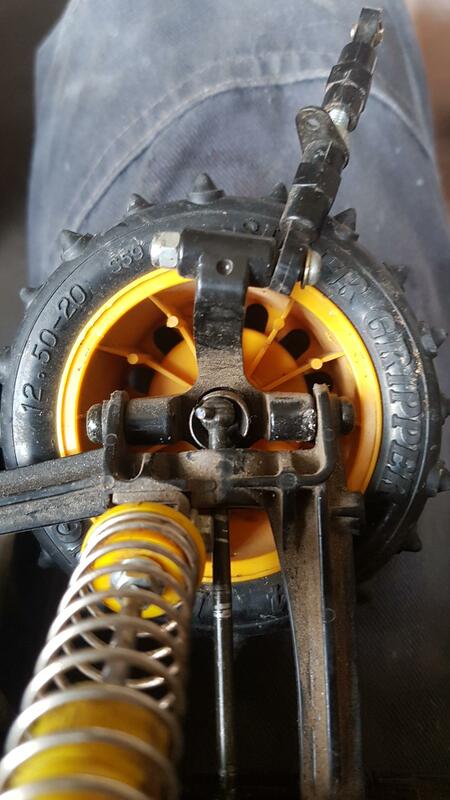 It has very little wear and has all the correct parts so im not sure if i should modify it or not. I have slightly enlarged the hole in the chassis for the battery plug so i can fit my lipos though. What do people think? Standard, or slightly hopped up? As for motor, it can have a dynatech 01r or a technigold. What would you choose? Whatever doesnt go in this will probably go in my terra scorcher. Oh, still using my repaired front shock tower. Might get an alloy 2001 one to use though. would you be surprised, if I tell you you can have a 4000mAH hardcase lipo in the original battery tray? I´´ll make some pics for you. It´s a zippy flightmax 4000mAh, which is our spec class race battery, cheap (18€), very reliable and powerful. As I have them lying around, I often try to get them in my Vintage runners too. 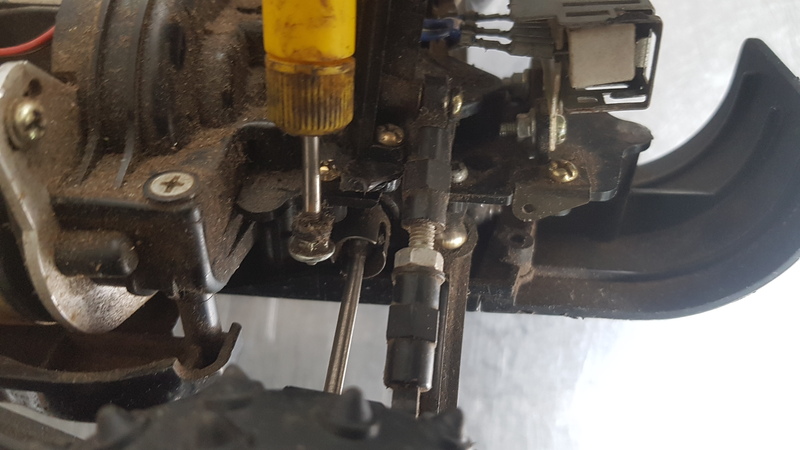 I just drilled 2 little holes in my (used) Vanquish chassis, to connect the wires to it. I´ll make some pics for you, maybe, it´s that what you search for! Pics would be good, thanks. My 3300 lipos fit this now, but ive modded the lipos and the vanquish. Given what I understand about these cars the aluminium uprights would be sensible for a runner if nothing else to preserve the original plastic parts. Bung the upgraded steering on too. With a fairly hot motor you'll need it to get in roughly the direction you would like. After that it's up to you, but cvas aren't bad shocks and they keep the classic look. Ball diffs depends on surface I guess? I have 2 pairs of original alloy uprights and the gold ones. I have quite alot of spares, not enough to build another vanquish, but with a couple of parts j could probably build a stick vanquish and a hybrid avante/egress/vanquish to drive. I guess thats another option. If i made some custom shock towers and bought a bumper i think id have most of what i need. I have ideas about some custom vanquish parts too which would solve alot of its weak points.